I’ve been doing a lot of alphabet dancing lately, using a project model I first developed in 2001. The project revival has been instigated by a video project to film and record resource material for teachers and students to create their own Alphabet Dances. Then again, good projects never really get tired! The Alphabet Dance is definitely one of my most enduring and popular projects. I first created an Alphabet Dance in 2001 as part of the Lingua Franca project at Western English Language School. I was inspired by the Leigh Warren Dancers (professional contemporary dance company from South Australia) and their show Quick Brown Fox, which was derived from an ‘alphabet’ of dance moves and sequences. In my Alphabet Dance project, participants create 26 short dance moves (from any style of dance they like), one for each letter of the English alphabet, then use that alphabet of moves to spell words, sentences and phrases, and create dance sequences. I wrote a detailed teaching resource on the Alphabet Dance for the Song Room in 2009, and ran a training session for artists at that time; and my blog posts (here is one) on the topic in 2007 were the recipients of my first-ever pingbacks! This term, in order to have some children’s creations included in the video, I asked the Upper Primary students at CELS to create their own alphabet of moves. They did their film shoot at school yesterday morning. Here is my own quick grab of their work. My final two performances for the year were with the children from Pelican Primary School. First, the choir performed at Federation Square, which was a wonderful chance for them to put their work in context with other primary school choirs from around Melbourne (I think they felt they fared pretty well in the comparison!). Then we held the end-of-year concert, in which every class performed. I’ve really enjoyed my year at Pelican. I feel, after two years working there, I’ve now found an approach with these children that works well. Inspired by my reading of Lucy Green’s research, and the Musical Futures ideas that I learned about in the April workshop, I’ve been using a lot of popular music as the vehicles for developing musical understanding among the students. It’s resulted in huge student engagement, a real love for music classes and participation, and lots of creative ideas, being generated by the students themselves. This year I put together a small band of parents to accompany all the concert items. I had a guitarist, a violinist/pianist and a percussionist. I roped in Tony to play bass guitar. We got together a week before the concert to rehearse each of the songs. The Parents Rock! Band (as I called them) was a hit. I want this idea to grow. Hopefully we can draw more parents into it, particularly from the African communities that are so strong in our community. Year 2/3 performed a version of K’naan’s Wavin’ Flag. One of the students learns piano and I’d given him a simple chart with the melody and harmonic accompaniment for the 2 sections of the song. This little boy is normally very quiet and reluctant to participate in his class’ music lessons (I suspect it all gets too noisy for him). I’ve never seen him smile so broadly, and look as proud as he did in the whole-school dress rehearsal the day of the concert, when he performed with his class and with the Parents Rock! Band. The year 4/5, who earlier had had a hit with their rendition of California Dreamin’, sang Rolling in the Deep. Again, we sang in two parts, and had a number of soloists. In the staff room on the day of the concert, teachers raved about the different solo singers, expressing their delight in hearing how good the voices were – qualities they often hadn’t realised were there. The grade 5/6 students developed a dance routine for Party Rock Anthem. This was the concert finale. I found some choreography on Youtube, and we worked with that for 4 weeks, watching the video in class on the interactive whiteboard. Lots of them watched it outside of school hours too. It became a real project – something that was challenging to learn but possible. “This is not just about learning to dance,” I told them. “It’s a chance to learn how you learn, how you can teach yourself new things by working on them consistently.” They were hugely motivated – the most motivated I’ve seen them all year – and took tremendous ownership of their concert item. They requested an edited version of the song (some of the sections needed to be doubled in length to fit their choreography), listened carefully when I explained the song’s structure, and developed a some good ensemble choreography. Equally significant was the difference in their interpersonal relationships. This is a class that is often hard on each other – they are quick to laugh and jeer when one of the group makes a mistake in class – it’s quite alarming to witness sometimes. This meanness started to lessen during the dance project. When individuals moved into the centre of the space to perform short solos, the rest of the group whooped, cheered and clapped, supporting them on. We told them to do this initially, but again, they took it on and made it their own. There was so much pride and confidence spilling out of that class by the night of the concert – they were so excited to performed their dance! The choir gave their best performance of the year at the end-of-year concert. We sang three songs – Vuma vuma ( a 2-part Zulu song that I learned from one of my students at NMIT), which we sang with dance actions; La Isla Bonita, taking our 2-part harmonies directly from the Madonna recording; and Firework, taking inspiration from the version performed by PS22 Chorus. This has been such a successful year for the choir. I’ve had 34 consistent members throughout the year – that’s nearly 3 times the usual number. I’ve had equal numbers of boys and girls, and strong participation from students in older classes. I started the year by finding them tangible examples (‘models’) for them to look to in developing their voices and building ambition about what they could achieve in the choir. I developed a more formal structure for rehearsals to which they responded particularly well. With all of these initiatives, I wanted to help them put their work in context – to see their work as being authentic, with real-world value. The choice of popular songs helps with this, but we also sang several more traditional or varied songs, such as Joshua Fought the Battle of Jericho, one of our main concert songs this year. Choir now has cachet in the school, I think. Or the latest dance routine they’ve made up. The lunchtime immediately after the younger years saw the year 5/6 shuffle dance, there were huddles of prep, grade 1 & 2 shufflers scattered all across the playground. The students teach their siblings the songs they are learning in class. Something I loved about the whole-school dress rehearsal on the day of the concert was the way the children sang along with each others’ songs. A couple of weekends ago I was up in Sydney working with the Australian Chamber Orchestra [ACO] and Western Sydney Dance, and the Parramatta Youth Strings, and composer Matthew Hindson. A lot of collaborators, all contributing to a fabulous performance project developed by the ACO. The idea was to create a new dance work, using music composed especially for it. 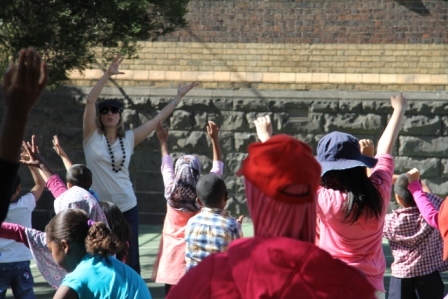 But this was not to be a typical composer commission – Vicki, Education Manager at the ACO and the brains behind the project, wanted the players in the Parramatta Youth Strings (who would perform the work for the dancers alongside members of the ACO) to compose the music themselves. There is huge value in young players composing the music that they will perform. If you use creative process that utilises improvisation as a way of developing ideas, they will invent things that are within their capacity to play. They will also have a strong sense of ownership of the music, and connection to the work, that will provide an additional incentive to realising it to the best of their abilities. Today I spent the morning with a team of teaching artists for The Song Room. The Song Room will soon be publishing the resource I wrote for them last year on my Alphabet Dance project idea (which I also described in detail on this blog here, here and here, if you want to check it out) and today’s workshop was to introduce the project to the Teaching Artists, who work in schools across Victoria. The idea is that they will introduce it to the teachers in their schools, and we hope that its broad appeal will mean we start to see little waves of alphabet dances fanning out across the state. You couldn’t ask for a better bunch of workshop participants! This group took the idea of the Alphabet Dance and made it their own. Basically, the idea is to assign a movement to each letter of the alphabet, then use these to spell words and create dances. I had a feeling the Teaching Artists would come up with something truly original, and they didn’t disappoint. Yeah, they’re really cool [clap]! All claps on off-beats. We naturally fell into a side-step move while doing this, and a lot of vocal additions and embellishments (Ah yeah!… That’s right!… ah-huh, ah-huh…. Because the-… etc). Then they created dances using the alphabet on the words Flash Gordon, Ziggy Stardust, and Battleship FTL-Drive. Huge commitment to every gesture. A drummer accompanying us, giving it even more momentum. It definitely showed the potential of the project idea. Thanks all, that was a great high-energy workshop! The Alphabet Dance gets kids spelling out loud, and offers new motivations for thinking about how different words are spelt. I have found that children who are struggling with literacy get a lot of confidence and enjoyment with the Alphabet Dance – they are highly motivated to learn the different moves, and the order of the letters. There are lots of follow-on activities you can do once you have built an alphabet of moves – consider putting together flicker books that spell out words using photos of the different dance moves, for example. Of creating large-scale wall friezes of all of the ‘letters’, drawn or photographed, or sketched as stick figures (for those like me who are challenged in the visual art department). Members of the Song Room (schools participating, or previously participating in Song Room programs who have signed up for membership) will be able to download the resource from The Song Room website when it is launched later this month. What a gorgeous class this is! So little, and so bright. The teacher and I have been working closely to develop our unit of work, focused around the theme of The Beach. We’ve brainstormed words in music class based on worksheets she has done with the students, so they have lots of vocabulary to contribute, and she is following up any songwriting we do in class too. All of which means we have loads of cool material, that the students feel familiar with. I’ve got my bucket, I’ve got my spade. I’ve got my sunhat, I’ve got my sunscreen. The last line is quite hard for them to say. Which leads back into the chorus. They’ll accompany themselves on the big bass xylophone, and really, we are all having a ball with this song. MP have focused most of their work on developing an alphabet dance – a sequence of moves that has a specific movement or gesture for each letter of the alphabet. Today we completed the remaining letters of the alphabet and started to spell out words that they know (which are mostly different types of fruit. Fruit is a big vocab focus this term, it seems). In addition to the dance, we are doing instrument work. They would probably mutinee if we didn’t – they do love the instruments above all other things we do in music. Every 2 minutes, someone will thrust a hand in the air, wave it at me frantically, saying, “Excuse me! Excuse me!” regardless of what I am saying to the class or in the middle of doing. When I ask them what they want to say, they point to one of the drums (it’s always a drum) and say, sweetly, “Can I play that?” It’s amusing, but definitely annoying after a while. So… we are making Name Rhythms, where we string four names from the class together and play the rhythm of the syllables on instruments. This composing technique works very well, although it can be a bit limiting in a class with lots of Chinese and African children as they invariably have names of 2 syllables only. Fortunately this term we have a Thai girl (4 syllables), the class teacher (4 syllables), an Iranian boy (3 syllables) and a Burmese boy (1 syllable) to spice things up. There are a lot of new students in UP this term, and most have very little English to work with. My original idea was to bounce off their Food and Cooking theme and do some composing around recipes, but I have decided to shelve that idea, as they simply don’t have the language yet, and the majority wouldn’t understand. Instead, we will work on some foundations of ensemble music (playing in time, keeping tempo, listening to multiple contrasting lines, starting points for inventing rhythms and melodies) via a fantastic song called Brixton Market. I taught them this song in the first lesson of the day, and had it in my head for the rest of the day. I bet they did too – it is very catchy. (I just googled the singer and the song and came up with nothing – if anyone reading can provide a link to more info about this excellent song for children, please post it in the comments section). It mentions lots of different foods for sale in the market, so we will probably write a new verse (for one of the Melbourne markets – Preston or Victoria probably, as these are the ones near where the students live). Friday afternoon lessons with the secondary students can sometimes feel a bit uphill. It is the end of the week – they are tired, I am tired, and even though they are a wonderfully good-natured and cooperative class, sometimes we are just not at our best on a Friday afternoon. Not so last Friday. We have spent the last few weeks building up a piece for performance that uses material developed through a few different tasks – energetic, syncopated rhythms made from students’ names; improvised riffs on the pentatonic scale; and drum ‘alphabet’ rhythms – as section content for a piece that I really like. It is a bit West African in feel, and we have developed words that we sing in unison with the main xylophone riff. Last week we agreed that this piece could do with either a rap, or a dance section. On Friday we created the dance. A number of the students are enthusiastic dancers, so we started by sharing ideas for moves. I should add here, I LOVE dancing. It is years since I took any classes (which I do periodically, for fun), and I have certainly never studied it seriously. But when I develop dance content with my students I always join in, and I always hope they will teach me some new moves. Once we had a bank of possible moves built up I performed them one by one for the students and they voted ‘yes- keep it’ or ‘no – lose it’. Then we looked at all the moves that had got a ‘yes’ vote and decided together which order they should go in in the dance, and the number of repetitions each should have. We had an excellent day of music lessons on Friday. The Musical Alphabets project is coming to fruition, and the performance piece is looking and sounding very strong indeed. We have a Chorus, which is first chanted, then ‘spelt’ using the dance moves (BANANAS! BANANAS! I LIKE BANANAS!) and we have four groups, each with a different fruit (chosen by the students) to spell. (PEAR, ORANGE, APPLES, WATERMELON). We practised the Chorus all together, and arranged ourselves into rows. They then worked in the small groups to practise spelling their fruit word while the three adults (class teacher, Melanie the Melbourne Uni intern, and me) moved from group to group, offering encouragement and assistance, and keeping them focused on the task. We experimented with a couple of structural ideas. I liked the idea of layering the different fruit words together, so that two might be performed at the same time. However, the students found this confusing; they felt much less confident about performing their own word if others were performing a different word at the same time, in the next row. So we tried a different arrangement, where each word was spelt four times in a row, one by one. While the groups waited their turn they remained in formation and waited in ‘T’ position (crouching down on the ground, in our alphabet). In an earlier post I was questioning how much of this task the students understood. I had a fun day at the Language School today. We are seven weeks into Term 3 (so three weeks from the end of term) and by this time we are in the rehearsal stage for this term’s compositions. Middle Primary students have created two group pieces. The first – “Winter” – was started when we were in the grip of a really cold series of winter days. We explored the sensation of ‘cold’ first physically (pressing our hands and cheeks against cold surfaces outside, opening the windows and feeling the cold wind enter the room and touch us) and then aurally, going through all the percussion instruments in the room and ranking them in order of the ‘coldest’ sounds, and techniques for producing cold, rather than warm sounds. This exploration has resulted in a 3-sectioned piece, involving a big ‘shiver’ of cold sounds added progressively, a multi-layered melodic piece utilising ‘cold’ sounds played in rhythmic and melodic ostinati, and a version of Largo from Winter from Vivaldi’s Four Seasons (with the solo performed by Melanie, our wonderful violinist and intern from the Melbourne Conservatorium). Of course the weather is much warmer now, with recent temperatures reaching 25 degrees (bit alarming for August – it is still supposed to be winter! ); we will need to imagine ourselves back into those cold days for the performance. Middle Primary’s second composition is drawn from their work with the Alphabet Dance, in which they created a dance movement or gesture for each letter of the alphabet. We have now started to choose words to spell out, and to arrange these into a dance piece. BANANAS! BANANAS! I – LIKE – BANANAS! (Try to imagine the funky syncopated rhythm we use for this).